Some failures lead to phenomenal successes, and this American nurse's unsuccessful attempt to climb K2, the world's second tallest mountain, is one of them. Dangerously ill when he finished his climb in 1993, Mortenson was sheltered for seven weeks by the small Pakistani village of Korphe; in return, he promised to build the impoverished town's first school, a project that grew into the Central Asia Institute, which has since constructed more than 50 schools across rural Pakistan and Afghanistan. Coauthor Relin recounts Mortenson's efforts in fascinating detail, presenting compelling portraits of the village elders, con artists, philanthropists, mujahideen, Taliban officials, ambitious school girls and upright Muslims Mortenson met along the way. 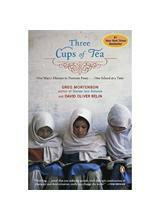 As the book moves into the post-9/11 world, Mortenson and Relin argue that the United States must fight Islamic extremism in the region through collaborative efforts to alleviate poverty and improve access to education, especially for girls. Captivating and suspenseful, with engrossing accounts of both hostilities and unlikely friendships, this book will win many readers' hearts. Request: Three Cups of Tea.